With our ears glued to the media, some of us listened to the budget, and some had the opportunity to listen it to from the parliament gallery. It was to be an out-of-the-box budget anyway, and, hence, many an expectation. Of course our primary interest was in hearing how the budget would take up Science, Technology and Innovation in planning the way forward for our economy. While standing, the Hon. Minister of Finance did not say much on this topic. Therefore, there was disappointment to us as listeners. However, reading the actual budget speech in totality, there was much to be happy about. Thus, we believe that this is the Sri Lankan budget where much on Science, Technology and Innovation had been embedded into plans, statements and pledges. Much had been written about the budget by now and I have not been able to view any of those statements in the budget speech picked up by reviewers. Hence this write-up in highlighting some of the inclusions. It is also an indication that society at large - from the public spirited to business spirited - does not take science, technology and innovation as important to our growth and well being. It appears that, to most people, it is dollars and rupees that get converted to highways, water distribution schemes, communications, fertilizer and medicine; and finding more of the currency is the path to salvation. Hence the idea that if we have lots of dollars the situation is fine; although, admittedly, this is true to some extent. However, minting or printing dollars is not the way to generate wealth; and this is where STI counts. If the rupee to dollar ratio is acceptable – some do want it quite differently, though, so that one can get more out of it with one dollar, keeping a larger group of personnel somewhat happy! – then, that too is considered to be the magical ingredient. Some actually believe that if you get more rupees for a dollar, it is a reflection of growth! I do remember once the outburst of an industrialist when it was mentioned through the development of hi-tech industries via nanotechnology etc., that one can look forward even to a strengthened rupee and the frown on his face was quite noticeable. Budgets do definitely bring out different responses and those are to do with individual perspectives. Widely differing interpretations are observed, and this is an issue. Is there a role to move forward to building an educated perspective among the stakeholder community and right communication appears to be a social responsibility? As the budget is not given due credit in this particular area of Science, Technology and Innovation, let me extract some of the interesting contents of the 2016 budget. Under the heading of Research and Development for an Innovation led Economy is itself a significant declaration. Innovation led Economy as a state policy is extremely interesting and, under the broader concept of a social market, may be quite interesting. One really hopes that the concept would move forward. From an STI perspective, this declaration is quite welcome. For the first time, the expectation for hi-tech exports to contribute to 10% of national exports by 2020 is indicated which really means a significant amount of upstream activities with definite STI interventions. The setting up of an innovation accelerator, a platform that will combine the National Innovation Programmes (NIPs) of the Coordinating Secretariat for Science, Technology and Innovation (COSTI) and the National Thematic Research Programme (NTRP), and the technology support schemes of the National Science Foundation (NSF) had been stated. The National Innovation Centre of the Ministry of Science, Technology and Research will lead this task and the budget identifies an initial seed capital of Rs. 100 million with another Rs 3,000 million over the next three years. Also a commitment to convert innovations into commercial successes is indicated. Included in the budget are the statements: High end equipment acquisition supported with accelerated depreciation etc. will be made available to any company that will partner innovations to be monetised and the Government’s commitment to facilitate these ventures by providing land or any other resources based on the type of project. Public spaces for innovation enterprises have been identified. This is contained in the statement. I propose that the Nenasala centres be upgraded to Public Innovation Centers for Entrepreneurship. As such, Nenasala centres should be upgraded to include a 3D printer, laser cutters and engravers, and other power tools which are vital for a typical fabrication lab. The budget allocates Rs. 100 million to upgrade selected Nenasala centres in 2016. These centres, in addition to their usual task of facilitating ICT empowerment, will also drive local entrepreneurship and provide technology support to SMEs. There are plenty of other statements which cover the whole value chain of innovation. Research funds have been allocated on other specific issues – plantations and specific diseases such as dengue, CKDu, cancer etc. Money has been allocated to improving the protection of intellectual property as well as for becoming a party to the Madrid system. The Inventors Commission is supported to come out with a strategy to promote patent applications worldwide by promoting awareness among inventors on benefits of international patent rights along with supporting the cost of international patenting. Some incentives have also been proposed to researchers in public institutes. An important development is the triple tax exemptions given to those who would contribute to setting up of endowment chairs within the public university system. The Budget publicly acknowledged three medical doctors who are inventors and were gold medallists in Geneva 2015 which perhaps is another first. As ideas are more important than a sliding rupee, an interesting proposal is the loan scheme of up to Rs 1.5 million per viable idea per person over tenure of 3 years. An expected 100 business start-ups per annum is a welcome initiative. Highlighted again is the Government’s keenness to stimulate the start-up eco system. The statement to include specific industrial estates – Biotechnology Park, Product Design Engineering Manufacturing Park, IT Park and Agro and Aqua Culture Parks along the expressway are important finally to realise the research into rupees as well as to generate sector specific high-end FDI. The proposal to only allow the triple deduction of research and development expenses only if there is technology advancement and yields development is seriously regressive, and it is hoped this will be changed during debate and discussion. This is contrary to the very basic philosophy of tax credits for R&D initiatives. If these important and relevant ideas and proposals are to be realised, the tried and tested triple helix nexus must be developed and promoted. 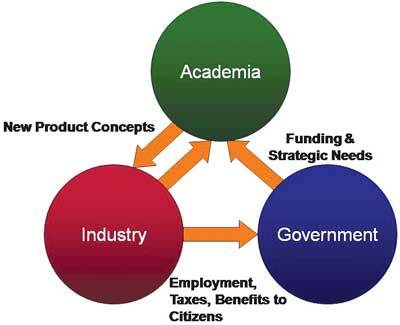 Triple helix refers to the State, Universities and Industry, and indicates working in unison towards common goals of creativity and economic growth. Each one would have an empathic understanding of the other and the sectors complementing each other towards goals identified together. This really is a missing element in our system and progress simply would be a daydream if one is to ignore this important nexus. Today, I will only reiterate the need for the national triple helix strategy and will expand on the theme in my next column. William Faulkner reminded us that you cannot swim for new horizons until you have the courage to lose sight of the shore. It is important to reflect on this as we were at an early stage conquered by the gun and today we are subdued by the dollar. As an island nation we have eminently demonstrated our intent to stay well within our shores. An out-of-the-box budget to have only high impact statements is not sufficient and one person and a ministry cannot do changes either. How do you entice the community to understand and move forward? We have consistently stayed clear of science and technology. Research and development had not been our favourite catchphrases. No nation either big or small has crossed the development chasm through the mere juggling of macro or micro economic parameters. Let us admit even at this late hour it was science for insight and technology for transformation that should be tapped in this journey of excellence envisaged. This is not recommending that we stay blindly with STI but integrate arts and humanities with commerce in managing growth and ensuring equality and equity, as pure technology could perhaps lead to a dehumanised situation. That is why at all times the triple pillars of economics, environment and society should be considered. That too is a function of the triple helix in a sustainable world.